Moira Hiscock, Christina Lucey and Henry Hiscock. He was moving at quite a pace and wasn’t going to stop. However, to our delight, somebody appeared near us and presented him with a young baby, swiftly followed by someone from the other side with a larger child. I was very moved by Pope Francis’ message. Fortunately, as I speak Italian, I could understand much of what he said. The brief summaries in other languages didn’t do it justice. He spoke with great emotion, explaining the true meaning of hope and linking it to the situation of people who had been forced to leave everything: they were examples of people who truly understood hope. He spoke of opening arms to everybody and embracing them, just as Jesus did. It was really very moving and challenging. He also told us what a wonderful name Share the Journey was for this campaign. None of us should be afraid to share the journey of refugees and migrants, he said. 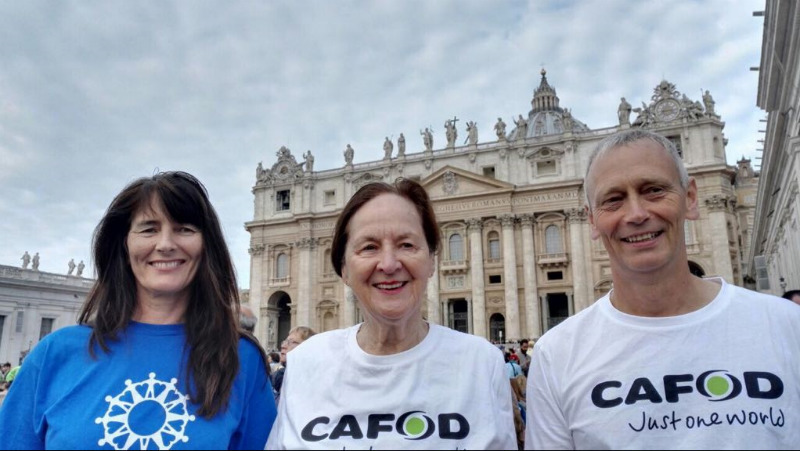 I have been involved with CAFOD campaigns with others in my parish and in the local area for over 15 years – campaigning on trade justice, Fairtrade, Make Poverty History and on many other issues of poverty and injustice. I shall be supporting the new Share the Journey campaign too. The response of the people in the crowd – some 30,000 people – was unlike I had witnessed at a previous papal audience when I saw Pope John Paul II at his first open-air audience in 1979. This time, there was none of the shouting and flag-waving which I had expected; but I think this was due to the serious subject matter. It was such a privilege to be in Saint Peter’s Square. The teaching on the real meaning of the word hope was very moving and thought-provoking. I only hope this message can reach out to people in our parishes who weren’t able to be there and hear for themselves. Pope Francis challenged us all to open our arms wide to welcome refugees, and all forced to leave their homes and possessions, who set off in hope in the true sense of the word, hope being all that they have left. The Share the Journey campaign is being led by Caritas Internationalis, a network of nearly 200 Catholic aid charities worldwide. CAFOD’s Share the Journey campaign launched at the beginning of 2018.